Anyway, back to the book. 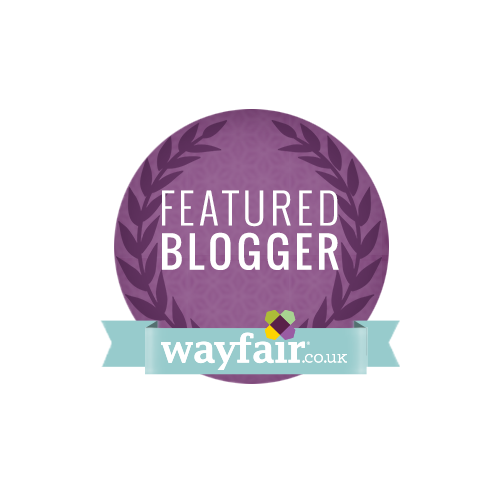 I'm a huge fan of this easy, relaxed and convivial style of writing. Martin and Paul appear to have genuinely enjoyed themselves in the photography and the recipe writing. They don't pander to nouvelle cuisine or fads and the food is fresh, delicious and as Irish as it gets. Take Bacon and Cabbage for example - it's not just a Mammy dinner here as Paul has turned it into a fabulous soup using the bacon leftovers and adding great quality ingredients for a lovely lunch. Martin brings a warm fish salad into the mix using monkfish, butterbeans and one of my favourite ingredients, semi-dried tomatoes which are incredibly simple to make at home. There are dishes to suit all tastes and skills in the book and it does a wonderful job of bringing fish to life. For a country surrounded by water, we're awfully afraid of fish, preferring it to be sanitised, unscented and covered in breadcrumbs. Not so here where you can cook Hake with Salsa Verde or Warm Lemon Sole Fillets with Caesar Salad & Parmesan Crisps. This is a book to read, digest and then place it behind a protective surface to stop it getting splattered by greasy fingerprints because you will use it, I promise. 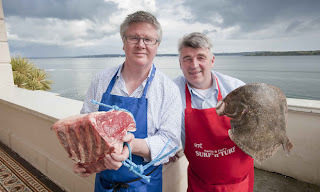 And if you're out and about in Munster, why not pay a visit to The Tannery in Dungarvan where Paul creates exceptional food including my favourite Crab Creme Brulee or to Kinsale for a meal at Fishy Fishy where Martin cooks fish in more ways than you would think possible. 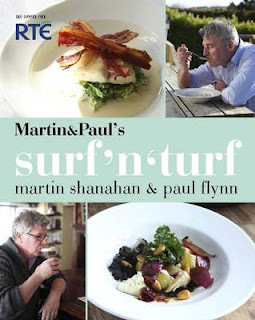 Martin & Paul's Surf 'n Turf is published by Quadrille and is available from all good bookstores and on Amazon. Love this series! The two of them are such messers!